Pixel Blue Eyes - Her "Tails of Adventure": Pixel's Pet Blogger Challenge 2014 - My Plans to "Pixelize" the Pet Blogging World! I have been blogging since September, 2008. I was a mere 9 months old, so Mommy helped me get it started. 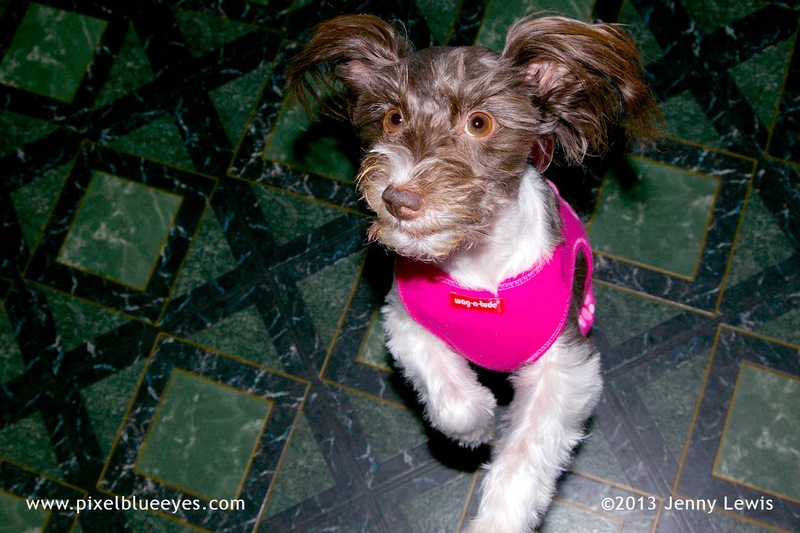 I found early on in life that I loved bringing joy to my Mommy and family. I was always having little adventures and Mommy was constantly taking photos. I also had a great aptitude for learning tricks, and that brought us both a great amount of joy! Mommy Jenny felt in her heart that it would be wonderful to share the joy I brought to her with others, so we started this blog. 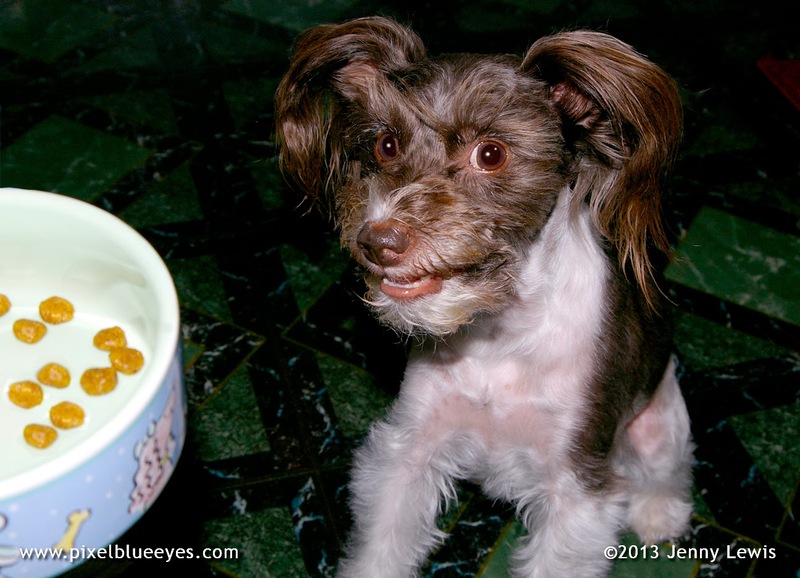 My "Pixel Blue Eyes - Her Tails of Adventure" blog documents my many adventures, escapades, and how I seek to find the joys in life, both big and small. 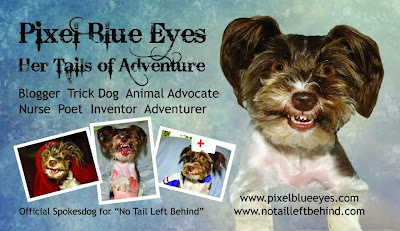 I share stories of my animal advocacy work and my experience as a nurse, trick dog, inventor and poet. To expand my blog's horizons, I have recently started doing reviews, hosting giveaways and reporting on things I feel other pets and people would appreciate, such as pet safety, books, pet toys, pet food, and other products. There is always lots of fun photos and smiles. Name one thing about your blog, or one blogging goal that you accomplished during 2013, that made you most proud. 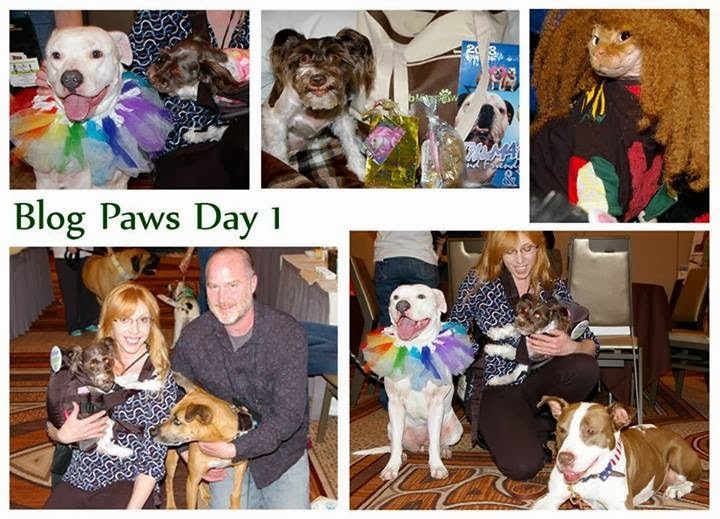 2013 marked the very first year I was able to go to the BlogPaws Pet Blogging and Social Media conference. It was a goal I'd had for a couple of years, but was never able to afford it. 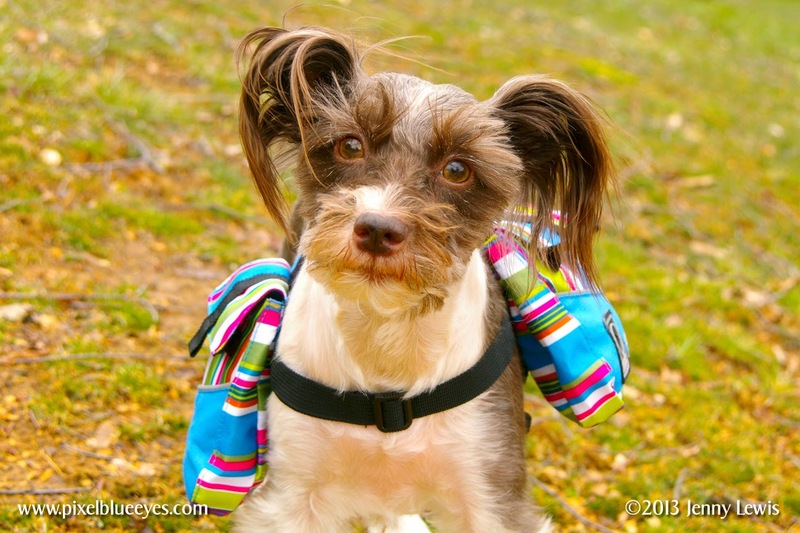 Then I came across a fortuitous blog post contest hosted by the one and only Tillman Skates of the show "Who Let the Dogs Out". I entered it and was one of two winners. Getting to attend the conference was an experience I'll never forget! I remember how thrilled and surprised I was on day one of the conference when I heard from across a crowded lobby, "Oh my God, is that PIXEL BLUE EYES?" My heart leapt out of my chest. Knowing that I had made enough of an impression with my readers that they instantly recognized me was such a joy and I was truly honored. While at the conference, I learned a great deal and got so many ideas for taking my blog to the next level. The wonderful friends and connections I made while there are the most precious part of it all. 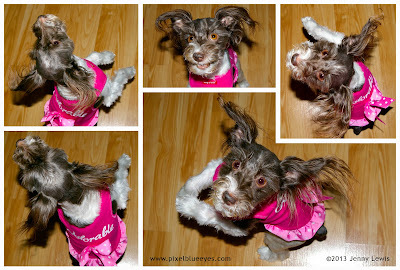 There is something inherently special about pet bloggers. They are instantly accepting with open arms and hearts, and they love to support each other in any way they can. 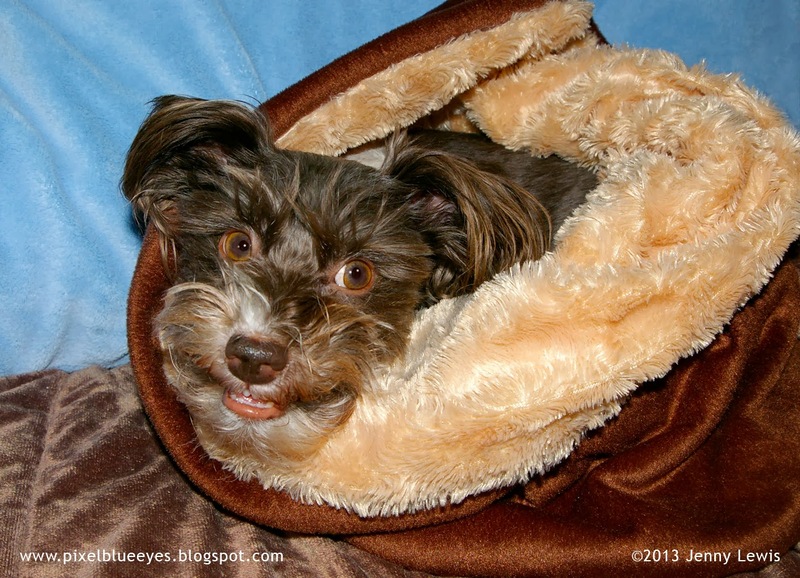 They've helped me in a number of ways as I expand my blog further. After attending BlogPaws I started getting some opportunities to work with companies and individuals on campaigns, reviews and giveaways. It's been such a fantastic experience! Mommy used to joke that I needed to get a job to pay for my blogging habit, so now I tell her that this little Pixel was listening and I finally am helping support my toy habit. My goal is to continue this trend of working with companies, advertising for pet products and getting a few sponsors on a much more regular basis. What lessons have you learned this year – from other blogs, or through your own experience – that could help us all with our -own sites? I've learned that you have to keep blogging on as regular a basis as you can so your audience keeps coming back. You don't need to have real long elaborate posts, you just need to post! I have a bad habit of only posting when I have something big planned or when I have a super amazing adventure with lots of photos. I then spend days working on one big post when I could instead do mini posts that are a 3 part series on one adventure. That would bring people coming back for more as they anticipate the next part of the adventure. I have set a goal of 3 blog posts a week this year, so I have GOT to follow this "do some short posts" advice this year. If you are producing great content, but then dropping off the face of the blogging planet for weeks at a time, you lose your audience no matter how great your adventures are. I have found that doing teasers on my Facebook and Twitter accounts can be quite helpful. I love all my friends & followers, and they are quite supportive of my blog. I'll pick a photo from my blog post (always a super fun or engaging one), then tell them a little bit about it. Then I ask my FB & Twitter friends to read the post, always making sure to include a link. I try to do at least one blog hop a week as well, though I'm not sure if it is actually bringing any more traffic than just regular posts since I get so few comments from them. But traffic in general has been steadily increasing each week, and I am very happy about that! How much time to do you spend publicizing your blog, and do you think you should spend more or less in the coming year? I do not spend that much time publicizing the blog and I definitely think I need to spend MORE time this year publicizing it. I share my blog on my social media outlets, but I do not do near as much publicizing as I should. It's just hard to do when Mommy has a full time job, regular volunteer work, and our No Tail Left Behind campaign to juggle in addition to my blog and online presence. As many other blogger experience, it can be hard enough just to get the blog posts done that you really want to do. We do talk to people about my blog all the time, and Mommy never leaves home without several of my business cards tucked in her pockets and purse at all times, ready to pitch the blog at a moment's notice! To be honest, that has often garnered the best response as far as publicity goes. But any advice on how to publicize would be greatly appreciated by my dear fellow bloggers! How do you gauge whether or not what you’re writing is appealing to your audience? I get a lot of positive, enthusiastic comments about the blog and my writing on my Facebook page, through Twitter and from comments made directly in blog posts. The feedback comes from friends I know and many people I do not know. I have many return blog readers and over and over again I've been told that I have charming, engaging style of writing that keeps my readers coming back for more. Every company or individual I've done blog posts for has given wonderful testimonials of how appealing my writing is, so I feel confident that my style of writing and blog content is fun, appealing and beloved. It is both thrilling and humbling to me. How do you know when it’s time to let go of a feature or theme that you've been writing about for a while? I am not sure I have this issue, so I cannot fully answer this question. If something makes me laugh, makes me think, makes me cry or makes me feel especially blessed about my own circumstances, then I am more often willing to leave a comment. I also might feel led to when someone writes about how they feel about a certain topic or situation, and I identify with them about it. I suppose the basic pull would be that it creates an emotional response for me. Do you do product reviews and/or giveaways? I just started doing product reviews and giveaways in the last 6 months and I love doing them! I enjoy making the giveaways exciting and doing product reviews that would make any company owner proud and excited to share it! If so, what do you find works best, and what doesn't work at all? My rule of paw is when someone approaches me to do a review, I feel it's important to give them my very best work. What works best for me is if I use my own "Pixelixed", aka personalized, photos with me using, playing with, eating, or interacting somehow with the product or item. If I review something and it is not going to be a positive review, I speak with the client first, and tell them of my concerns. I don't believe in blasting the product unnecessarily. That in turn could look bad on me. I'd rather not do the review at all. As for giveaways, I love the fun of getting people to enter and getting to make the "big announcements" Vanna White style. I do have a couple of "doesn't work at all" statements in regards to giveaways though. First of all, sometimes trying to get people to enter a giveaway is like pulling teeth, I don't know why. My last giveaway I had a hard time, well, giving it away. My second discovery for giveaways is that I will not ever do another giveaway without the help of a software program like Rafflecopter to help me, as many other bloggers have done. After my last giveaway, it was very hard trying to hunt down some of the winners so I could get their personal information and shipping information. 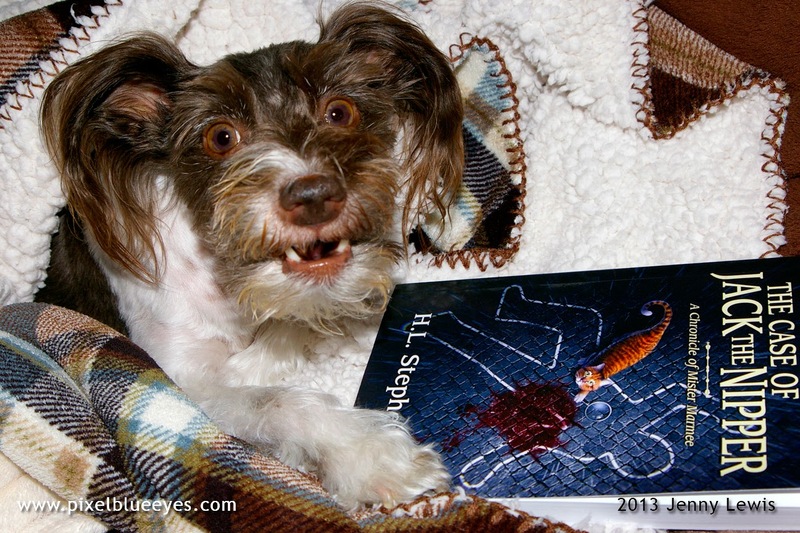 When I do a review, I really run with it and "Pixelize it" to make it a fun, personalized adventure or story. 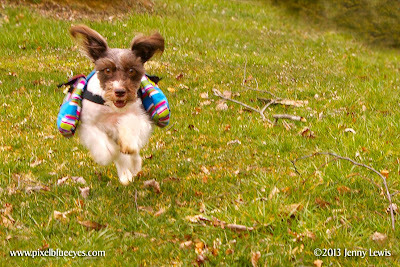 (Though I was not compensated, I did a great adventure review of the saddle bags in this photo. This is just one example of what companies would get from my "Pixelized Reviews", except that new reviews would of course include the product name and other pertinent information. 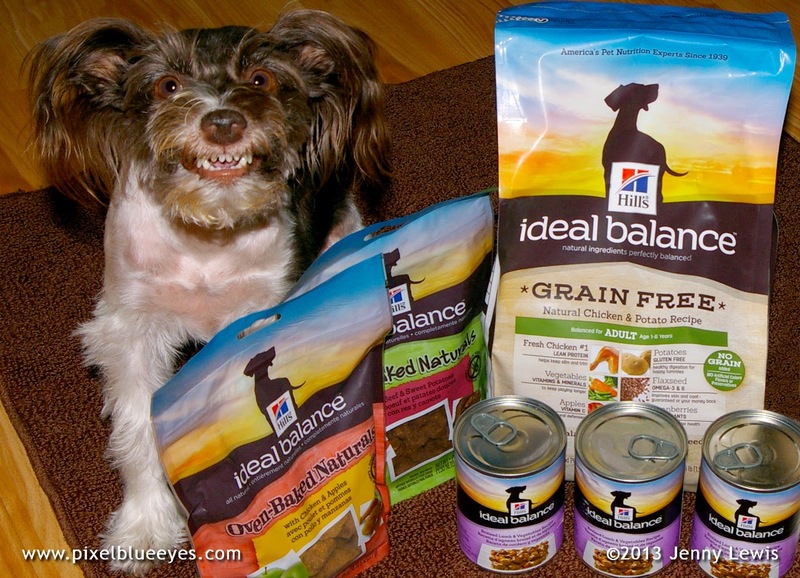 I loved doing the Hill's Ideal Balance campaign. It truly was a great adventure and they were fantastic to work with!! 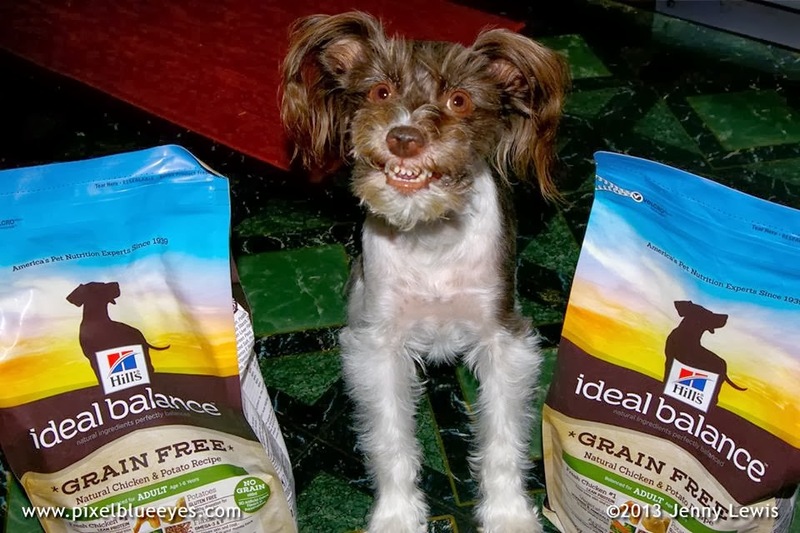 I would love to do more reviews and giveaways, especially of items relevant to pets, dogs and the theme of my blog, whether it is pet toys & products, books about animals, or various foods & treats, but the food items must be made with safe products and from safe locations. I would love to review a nice mix of items that I can use as well as products I know other dogs can use or enjoy. For example, I must eat only gluten free, corn free, and soy free items, but I could certainly do work with other brands depending on what they require. I am open to many possibilities. The only hurdle is finding companies who would like me to do their reviews. How can I get more exposure as a blog who loves to do reviews and giveaways? My catch phrase is "Have you been Pixelized?" I recharge in a number of ways. Mommy Jenny and I will sometimes go outside and play, or we will play inside. We love to play wrestle, or run around with toys. We also LOVE to dance together. We also sometimes just cuddle and watch TV or a movie. Mommy also loves taking photos of me while we play or while I do my tricks or dance. We just absolutely love being together, and we have a wonderful way of recharging each other's hearts and minds. I took a break a from the blog actually after the first few months of having it. For two years I barely blogged at all. I didn't have any readers at that time anyways, but I realized if I was going to have it, I needed to post to it a lot more than just a few times a year. I was very young then, and have learned a great deal since that time. 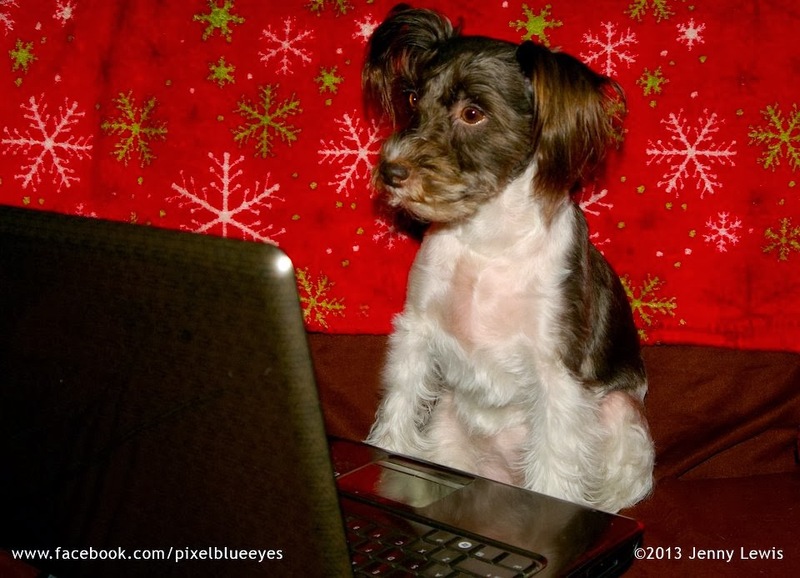 I also started looking for other pet bloggers that I got to know. I finally got serious much more serious about the blogging in the beginning of 2012, after a series of family emergencies that put my nursing skills to the ultimate test. Here's one of the few blog posts from that time period where I didn't blog for almost a year, The Joy of Caring for Those You Love. I have never thought about quitting the blog altogether. I don't know, it's something that I just can't help but want to do! It is a lot of hard work, and I never have enough time to do all I want to do for it, but it is fun, and I think I have a lot to offer the world. 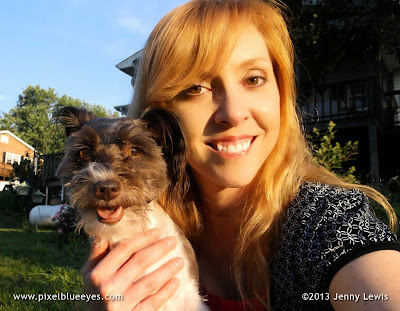 My ultimate goal, my dream, for both Mommy Jenny and myself, is to be able to do the blogging all the time. I love the whole package I present. The many fun, beautiful photos that bring so many smiles to everyone's faces, the fun writing, the way we can take anything and make it a Pixelized adventure, and the times when I am able to take my own experiences and share with the world that they are not alone in their own struggles. I love bringing real joy to others, and I can't imagine stopping that altogether. I am always so honored when someone tells me that my blog or my silly stories, videos or photos on the internet made their day or lifted them up from a tough time. 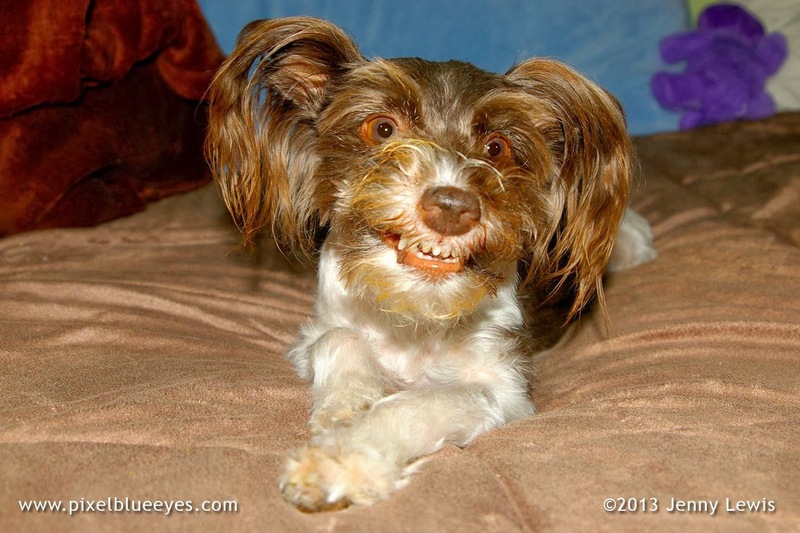 I never could have imagined that one little dog could make a difference, or bring joy to others, but I am so glad that I can be that smile for others. It brings me joy to bring others joy! My main goal is to continue turning the blog into a little business and turn a profit. I would like to increase my audience, get some full time sponsors, have classy, pet appropriate advertisers on my blog, and blog consistently with at least 3 posts a week. 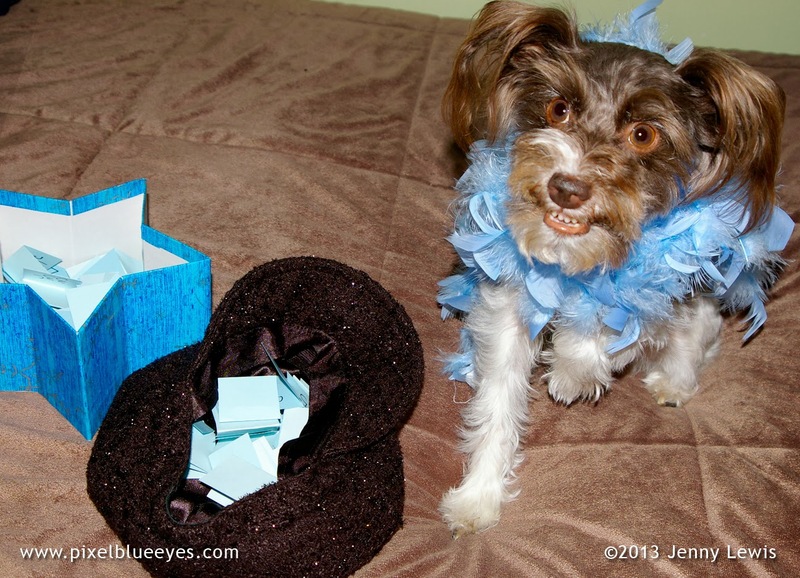 I want to attend BlogPaws 2014 this year and that will take some doing so I need all the help I can to make that happen. I know I have a lot more to do, but with the support of my family, friends and fellow pet bloggers, anything is possible!! 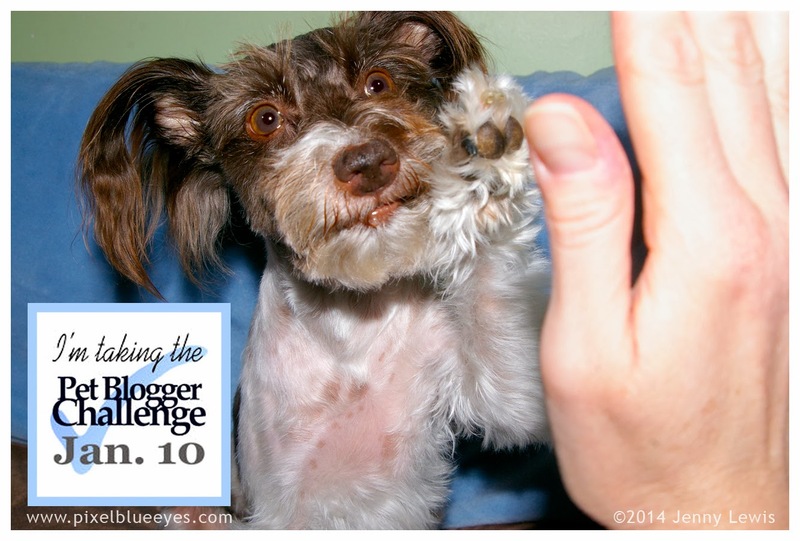 Many of my fellow pet bloggers took the 2014 Pet Blogger Challenge as well, which was hosted Go Pet Friendly and "Will My Dog Hate Me?" I missed getting to link up with the list below, but I wanted to make sure and share my fellow bloggers who took part. Don't miss out on what their plans are for 2014 too! Hi, Pixel and Jenny! Congratulations on having this space up and running since 2008! Jon and Dewi weren't even a thought in anyone's brain during 2008! I admire your goals and tenacity, Jenny, and wish you all the best for this coming year with that. I can't help but believe your passion and determination will continue to make "people" take notice of what you've created here. Mostly, though, I'm SO glad to have connected with you last year at BlogPaws! I hope we get to again in May (and trust me, it's going to take some DOING on my end, too)! Virginia absolutely needs some representation, right? This is awesome. 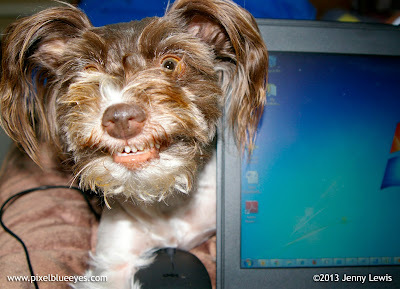 I just added the Paws Pet Blogger Conference to our calendar at BloggingTix.com. And my wife just brought home a cat, simultaneously. So it looks like I might be creating a pet blog now too. Great list, can't wait to learn about Pet Blogging. Thanks dear, I love your blog ! 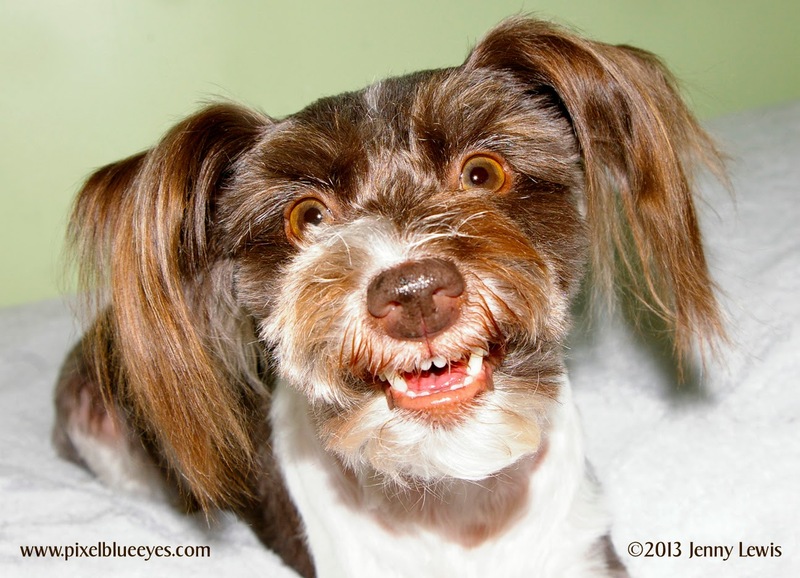 You have provided a good info through this blog about a pet. I’ve learned more Titan and Milo through this blog.